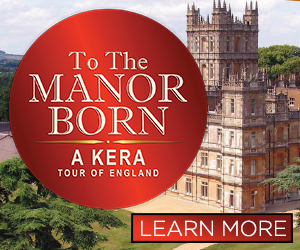 KERA is proud to offer savings to our members at performances, restaurants and other terrific venues throughout North Texas. 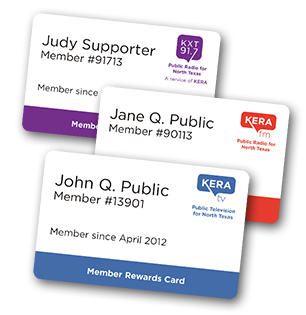 These member rewards are a way of saying “thank you” for your generous support of public television and radio programs on KERA. To receive your discount, please show your KERA or KXT Member Rewards Card when you visit or purchase tickets from the organizations listed below. When reserving tickets over the telephone, be sure to give the operator the member number printed on your card. Please continue to come back and check for new Member Reward Partners. ★ This star indicates KERA/KXT Member Rewards Partners offering our members Two-for-one or 50 percent discounts. We are grateful to all of the participating organizations for providing these savings to our members. $5 off any Thursday night performance. Not to be combined with other discounts. Limit two tickets per production per card member. Subject to availability. Make reservation at allenscommunitytheatre.net. Must present Member Rewards Card at box office. $5 discount on adult admission. Two-for-one tickets. 50 percent discount for one ticket. Maximum of 2 free tickets per production. Reservations must be made by calling the box office 214-810-3228. Not to be combined with other discounts. Must present Member Rewards Card at box office to obtain tickets. $5 discount off full general admission tickets. Limit two tickets per performance. Tickets may be purchased by calling the box office or online by entering promo code “KERA5OFF.” Offer not eligible in addition to other discounts, on preview nights or discount nights. Must show Member Rewards card at will call. Broadway Series: $10 off standard ticket price. Not valid in box sections or sections 2 or 3. Other restrictions may apply. Maximum of four tickets per rewards card. Children’s Theatre Series: $4 off standard ticket price. Valid in sections 1, 4-9 only. Not valid on Sundays. Other restrictions may apply. Maximum of eight tickets per rewards card. Tickets must be purchased in person at the Casa Mañana box office. Two-for-one discount on Friday night performances. Discount may not be combined with any other special offer or used for special engagements. Limit two per member. Reservations required. Complimentary valet parking on Throckmorton between Third and Fourth streets. Up to a Twenty percent discount on full-price single tickets for Friday evening performances and Saturday and Sunday matinees (excluding Saturdays at 4:30pm) on any 2018-2019 DCT Season production. Not valid for circus tickets (LSC Forever), special add-on shows, parties, student matinees, sensory friendly performances or with other offers. Limit four tickets per production. Two-for-one tickets. $5 off single ticket purchase. Cannot be combined with any other discounts. Limit two tickets per production per card member. Must present Member Rewards Card at box office to obtain tickets. Subject to availability. Make reservations by calling the box office (972) 878-7529. Two-for-one tickets for first Sunday matinee of each show. Must present Member Rewards Card; reservation required. Call 972-221-SHOW (7469). Two-for-one tickets on Friday and Sunday (not applicable to opening nights). $5 discount on adult tickets for any performance scheduled during the 2018-2019 season at Kitchen Dog Theater. Must present current Member Rewards Card at box office to receive discount. Must call 214-953-1055 to reserve seats in advance. Subject to availability. Not available on opening nights. Twenty percent discount on regular single ticket pricing (excluding student rush). Two-for-one tickets (limit four). This discount does not apply to fundraising performances. $7 off regular priced tickets for all shows in main season lineup. Not applicable on children’s shows or special events. Order online: choose ticket type “Member” and key in code “KERA” for $7 discount. Show Member Rewards Card at box office. Limit two per member. Fifty percent discount on any Thursday night or Sunday matinee and $6 off full-price admission on Friday and Saturday night performances. Not valid with any other discounts or special events or season extras. $5 discount off all general admission tickets. No limit. Tickets may be purchased by phone or online using the code “KERA5D” at checkout. Offer cannot be applied with other discounts or on preview nights. Up to a Twenty percent discount on full-price single tickets to musicals and plays. Not valid for holiday production, special add-on shows, or with other offers. Limit four tickets per production. Receive $5 off tickets to Theatre Three. Discount available by calling the box office at 214-871-3300 ext. 1 or online with promo code “KERAT3.” Must present Member Rewards Card at box office to obtain tickets. $5 off ticket reservations. Per ticket basis. KERA discount reservations must be made over the phone. Not to be combined with any other discounts. Cannot be used on preview nights. Two-for-one tickets (buy one, get one free) for Wednesday, Thursday, Friday, Saturday matinee and Sunday matinee performances at WaterTower Theatre. Only valid for Main Stage productions. Does NOT include previews, studio theatre productions, DETOUR Festival Gala or season extras. $2 off a full-price ticket. Twenty percent discount on concert tickets. Ten percent discount on single concert ticket purchase. Tickets must be purchased by calling the box office at (972) 385-7267. Two-for-one discount on select seats in Orchestra II and Orchestra III sections for all Cliburn at the Bass performances. Tickets to be purchased in person at the box office on the night of the performance. $10 tickets to Cliburn at the Modern performances. Two-for-one tickets or 50 percent off single tickets. Enter coupon code “KERA” at checkout online or by phone. Not redeemable at the door. Fifteen percent discount on single ticket prices for the 2018-2019 Meyerson Concert Series. Does not include holiday concerts. Discount is for the Meyerson venue only. Must call Dallas Winds at (214) 565-9463 for reservations. Ten percent discount on concert tickets. Buy one, get one or 50 percent off single tickets (any section) to Garland Symphony Orchestra’s season concerts. Tickets must be purchased in advance by calling the symphony office at (972) 926-0611 or the Granville Arts Center Box Office at (972) 205-2790. Buy one full price ticket, get one free. Must call Las Colinas Symphony Orchestra office for tickets. Two-for-one or 50 percent discount on regular priced tickets only. Must show Member Rewards Card. Two-for-one tickets, or 50 percent discount on single concert tickets. Fifty percent discount on regular priced single tickets. Tickets may be purchased by phone or online by entering promo code “KERA50.” Not valid for group and subscription tickets. Twenty percent discount on tickets to classical concerts (single tickets only). Limit four tickets per event. Subject to availability. Loge box seats and rows K and L excluded. Two-for-one admission for any of The Texas Voices season concerts. Fifteen percent discount on tickets to TITAS events, not including the Command Performance of International Ballet. Two-for-one or 50 percent discount on single tickets to concerts. Two-for-one or 50 percent discount on single tickets to any of The Women’s Chorus of Dallas concerts. Must show ID and valid Member Rewards Card at box office to receive discount. Two-for-one or 50 percent off museum admission or membership. Ten percent discount at museum gift shop. Not to be combined with other discounts. Must present current Member Rewards Card to receive discount. Two-for-one general admission. Valid on regular operating days (not valid for special events such as Candlelight). $2 off non-group admission ticket (limit four). $2 off admission. Must present current Member Rewards Card to receive discount. Discount may not be combined with any other offer. Two-for-one admission of equal or lesser value. Limit one per visit. Not valid for special events or education programs. $2 off general adult admission. Must present current Member Rewards Card to receive discount. Discount may not be combined with any other offer. Two-for-one or 50 percent discount on admission and 10 percent discount on gift shop purchases. Ten percent discount in museum gift shop. Discount cannot be combined with NCM member discount. Fifteen percent discount on New Memberships. Not eligible for renewals. Must show ID and valid Member Rewards Card at box office to receive discount. $2 off admission for up to two. Not valid for programs or events. Complimentary dessert with entrée purchase. Limit one per table, per visit. Fifteen percent discount on all purchases of fresh coffee or quality tea (retail only). For online purchases, include KERA/KXT member number in “Special Instructions” section at checkout. Members of KERA and KXT will be treated to a special little something from our Chef to complement your dining experience. One surprise per table with Member Rewards Card. Complimentary Top Shelf Guacamole with entrée purchase. Limit one per table, per visit. Chocolate Secrets & Wine Gardens, Inc.
Twenty percent off entrees. Alcoholic beverages excluded. Ten percent discount on purchases at all Top Pot Texas cafes. Free week of home-delivered health services, including comprehensive biometric assessment, natural health consulting, active aerobic assessment and professional personal training, (a $249 savings)! Then, add a spouse or friend to any service for just 30 percent more. Fifteen percent discount on a complete pair of glasses. Fifteen percent discount on all group classes. Must present current Member Rewards Card to receive discount. Discount may not be combined with any other offer. Twenty percent discount on all purchases. Member Rewards Card must be presented at time of purchase. AmazonSmile is a simple and automatic way for you to support KERA and KXT every time you shop, at no cost to you. When you shop at smile.amazon.com, you’ll find the exact same low prices, vast selection and convenient shopping experience as amazon.com, with the added bonus that Amazon will donate a portion of the purchase price to KERA/KXT. Save an additional 15 percent off all canvas prints. Use code KERA15 before checkout. One free day of co-working at any local Common Desk location. Redeemable once per year. Half-price memberships with CAC – Membership entitles participants to a $30 discount on every class or workshop and the opportunity to enter CAC’s Annual Membership Show. Student/Educator/senior memberships are $35 per year ($17.50 after discount), Individual memberships are $45 per year ($22.50 after discount), and Family (one household) memberships are $75 per year ($37.50 after discount). Fifteen percent discount on any membership level. Depending on level, a variety of benefits are offered including, discounts on programs, free admission to events, and invitations to exclusive patron-only events. Ten percent discount on tuition for one semester each year. When registering online, please enter “KERA/KXT Member Discount” in the “other information” section of the registration form. Only one discount per household. Discount may not be combined with any other offer. Save 25 percent on our spectacular collection of flowers, plants, gift baskets, baked goods and so much more! Whether you need same day, next day or want to plan ahead, we offer it all! Order online or call (800) 838-8853 and mention code “KERA.” Make someone smile today with a gift for any occasion…or no occasion at all! (800) SEND-FTD (800-736-3383) and mention code “6308.” Same and next day delivery available. *Some exceptions apply; see site for details. Ten percent off all purchases. Fifteen percent discount on all in-stock books, music, postcards, records, CDs, DVDs, MP3s, ephemera and all other wonderful items found in a large bookstore. Ten percent discount on regular-priced retail merchandise in our Dallas store. Must present Member Rewards Card. Link your Tom Thumb Rewards Card to the KERA Tom Thumb Good Neighbor Account #2643 and a percentage of your purchase will be donated to KERA. Ask Cashier for details. Fifty percent discount on $250 Donor-Level Membership, which includes a variety of benefits, such as priority member discounts, invitations to special members-only events, and a free subscription to Foreign Policy magazine. $25 off events and classes. Fifteen percent off all used products. Get custom foam board prints for your home or office. Use code KXT25 for $25 off your order. Ten percent off all food and drink (excluding alcohol). Student/member discount for all regular screenings. Additional 15 percent off sale items. This reward is redeemable at all three locations. ★ Indicates KERA/KXT Member Rewards Partners offering our members Two-for-one or 50 percent discounts. We are grateful to all of the participating organizations for providing these savings to our members. All ticket discounts are subject to availability and/or certain restrictions and are not valid with any other special offer unless otherwise specified. Discounts may not be available online; please call the organization prior to making an online purchase. Please call ahead for the organization’s address or performance location. Discounts in this listing are good through August 31, 2019.